Since Sweet Baby can finally have beef that means, BURGERS! I’ve been trying to make them more fun. She isn’t a ketchup and mustard girl, and that’s okay! Besides, there’s so much more you can do with a burger anyway 😉 Since I’m experimenting the #SayCheeseburger #CollectiveBias campaign came at the perfect time! 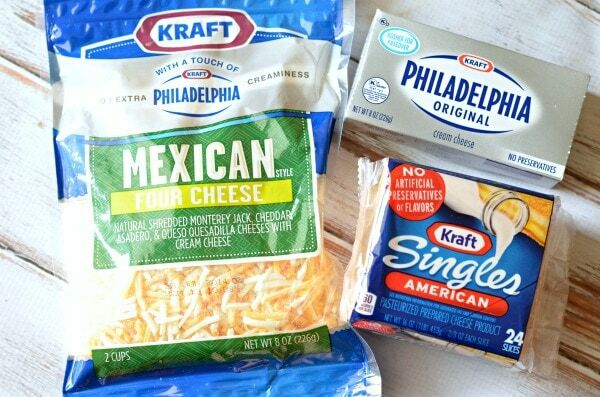 I purchased Kraft Singles, Philly Cream Cheese, Kraft Shreds in the Mexican Mexican Four Cheese at my local Walmart to have fun in the kitchen. Can I just say how happy I am that the Kraft Singles no longer contains Artificial Flavors, Preservatives or Flavors?? Kudos, Kraft! 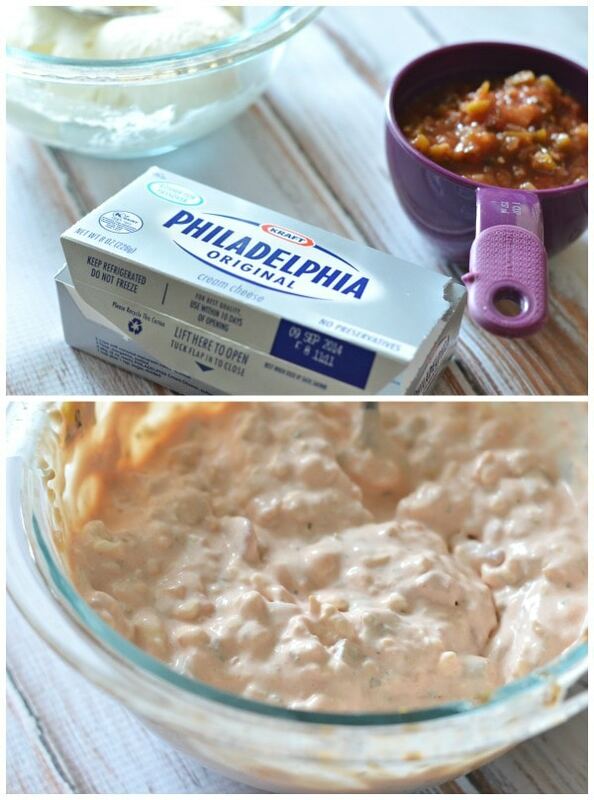 Anyway, I made a huge mistake and purchased some HOT salsa so I couldn’t bare wasting it so I actually mixed with some Philadelphia cream cheese, resulting in a mild creamy salsa! 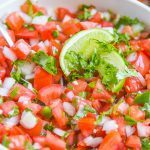 We love Mexican flavors so this would pair well with beef, don’t you agree? We buy all full fat dairy products, but you can opt for the less option. Sweet Baby loves fun food and I thought it would be SO much fun to actually STUFF the Kraft Singles into the burgers. 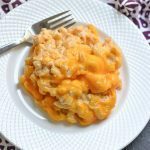 I mixed the burgers with the shredded cheese too – ultimate cheesiness going on here! 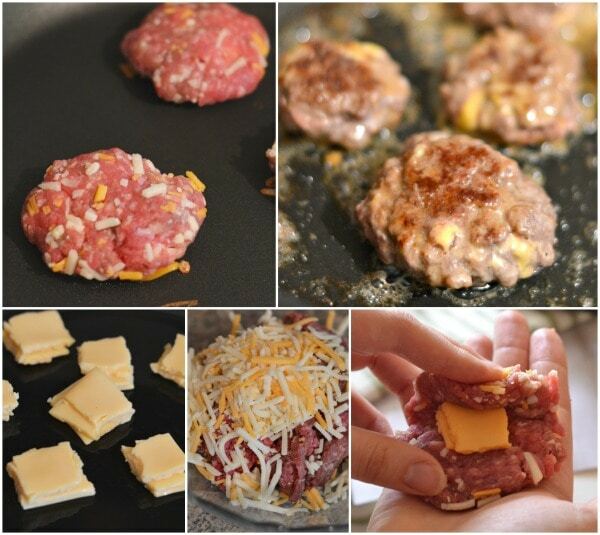 The cheese that was mixed in the burgers got all melty and gooey, delicious! I let some crisp up, but kept some nice and gooey too! 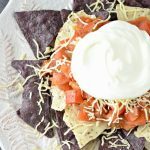 This Creamy Salsa Cheese Filled Slider Recipe is PERFECT for my little love, and my big love too! Kay can eat a whole one while daddy and mommy can eat about 3-5 😉 When Kay saw the inside she was so excited and just wanted to eat the cheese inside. Kids will be kids! I can’t blame her, cheese filled burgers are so much more fun! 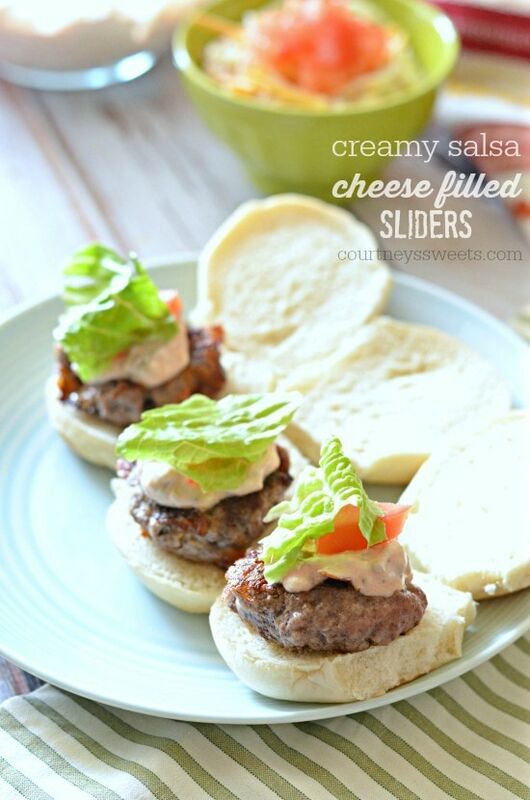 Top with a little “salad” and your sliders are sure to hit a home run! 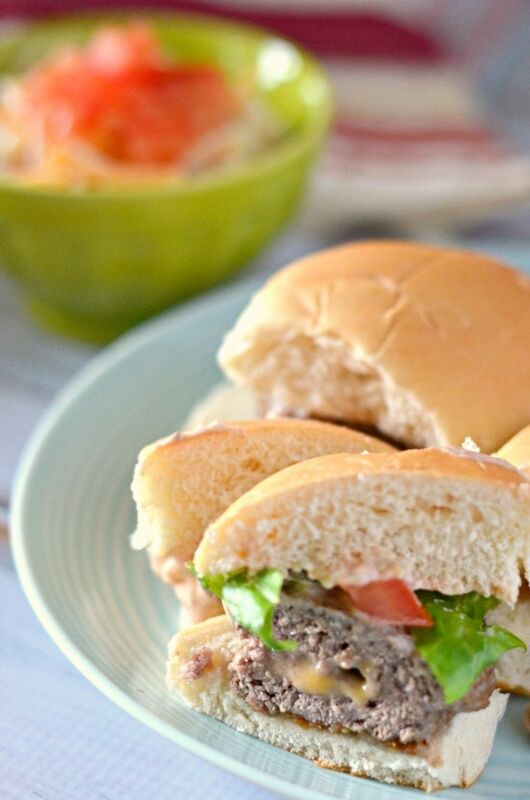 These mini sliders are a huge hit in our house and unfortunately we had no leftovers – I LOVE leftovers. 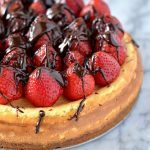 Next time I’m making a double batch! 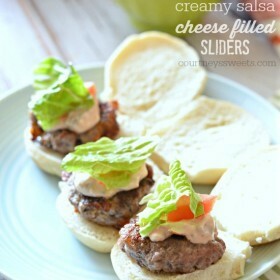 These cheeseburger sliders are filled with cheese and topped with a creamy salsa, MUST MAKE RECIPE! 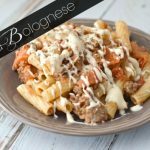 In a bowl combine beef, spices, and shredded cheese. Once combined roll into balls and flatten. 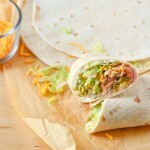 Fill with the cheese "stacks". 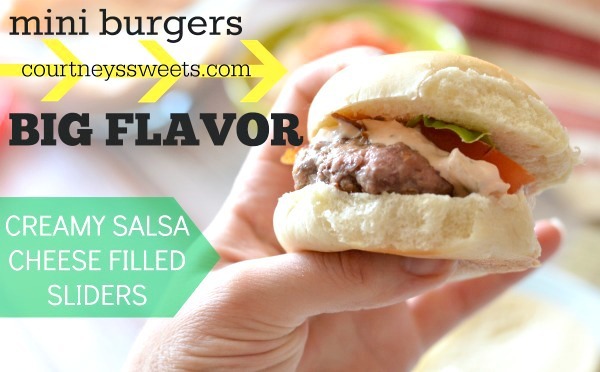 Place burgers on the bun, top with creamy salsa, lettuce, and tomato, ENJOY! 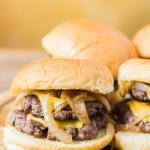 I like sliders as they are small and just enough to eat. 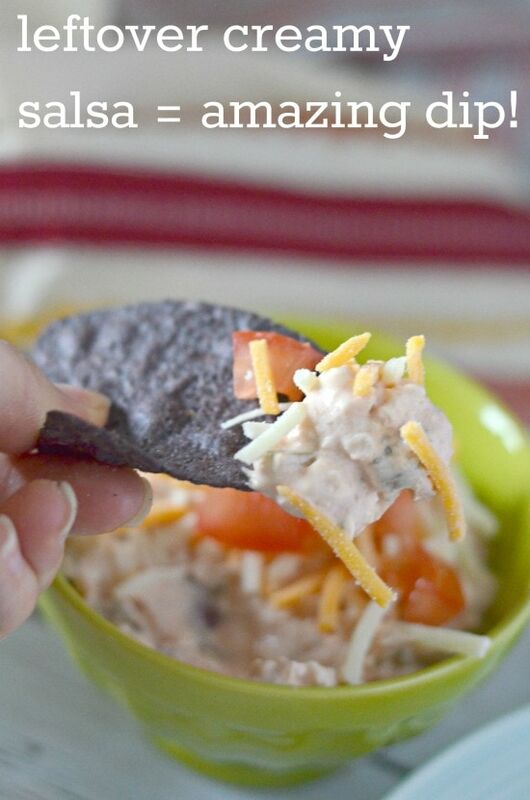 I like the idea of the cheese in the center. These would be awesome for football season! 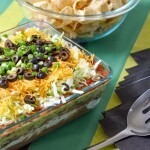 I would love to serve these our family football parties. Slider goodness! I get lots of these.